It's been a long time since the Flamenco guitarist Nikos Tsiachris had the idea to record a solo album. But just now the time was ripe for it. 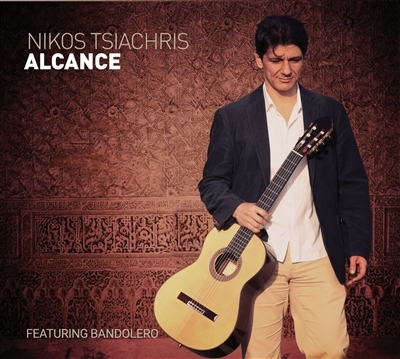 The new album “Alcance” by Nikos Tsiachris stands for a matured Flamenco artist whose outstanding playing style is presented in beautiful original compositions. Especially the 4 solo guitar pieces prove that the Berlin based artist with Greek roots can definitely keep up with the Spanish masters. Nikos Tsiachris was supported by the excellent percussion player Bandolero, who has already toured internationally with the “Jorge Pardo´s Trio” and the “Joaquín Cortés Ballet Flamenco”. On “Alcance” Bandolero plays cajón, palmas and jaleo and grands the album with a unique rhythmical note. Amazingly both musicians got to know each other just 2 days before the recording. But they musically understood each other right away and recorded these wonderful and diversified album. The first solo album by Nikos Tsiachris is a colorful album full of authenticity, passion and love!